Black Entertainment Television, longhand for BET, had its own Don Cornelius in Robert Johnson, who launched the network with his wife, Sheila, in 1980 and sold it to Viacom 20 years later for a reported $3 billion. But while Johnson profited immensely (and stayed on as CEO until 2006), BET remained stagnant creatively as a home for cut-rate unscripted programming and videos that were criticized by some for perpetuating African-American stereotypes. The network stayed away from costlier scripted comedies and dramas throughout most of Johnson’s reign. But BET’s latest president, Scott Mills, is making a big scripted push after the network’s Being Mary Jane, starring Gabrielle Union, had a four-season run and record-setting ratings. Mills is promising a veritable onslaught of scripted programming this year, with a commitment to premiere five original new series, according to The Hollywood Reporter. 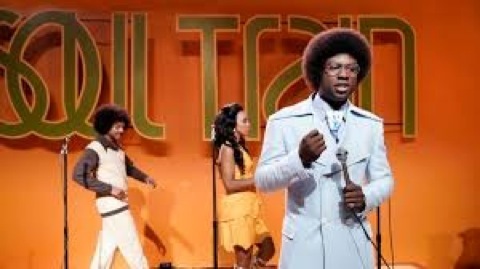 First in line is American Soul, a 10-episode drama series starring Sinqua Walls as Cornelius, the founding father of Soul Train. If actually true, it’s an interesting dichotomy. And based on the first two episodes of American Soul, BET is arguably having it both ways. One of the promotional tag lines for the series -- “Black folks as black folks was meant to be seen -- strong, powerful and beautiful” -- is also stated by Walls’ Cornelius in an Episode 1 scene with Gladys Knight (fine work by Kelly Rowland). Upcoming episodes will include portrayals of real-life star performers ranging from Diana Ross to Ike and Tina Turner. But the principal aspiring group in the early going is fictional. Brother and sister Kendall and Simone Clark (Jelani Winston, Katlyn Nichol), and their friend JT Tucker (Christopher Jefferson) comprise Encore, a stand-in for The Undisputed Truth. They were a one-hit wonder group, but it was a big one -- “Smiling Faces Sometimes.” Encore winningly performs it at a club, but the kids are found to be too young to work where alcohol is served. Simone and Kendall then resort to auditioning as Soul Train dancers while JT finds himself getting into trouble. The scenes from the set of Soul Train are well-captured and choreographed. But BET’s still limited production budgets are reflected in recurrent Vietnam War sequences involving the Clark kids’ father. They’re phony-looking to say the least, and really not needed at all. Walls, formerly of Starz’s Power series, is effective as Cornelius, although not to the point of blowing anyone away. His best scene is talking business to the reluctant Knight at a Gary, Indiana club. But American Soul also tends to bounce like a ping-pong ball from one set piece to another. The worst of this is when Cornelius is stopped by a taunting, white Los Angeles police officer for allegedly running a stop sign. “Sing for me,” he’s ordered, or be taken downtown. But the slobbering cop and his partner then get a call to a higher priority crime scene, which spares Cornelius any further indignities. It’s all very ham-handed. BET is moving in the right direction, though. The network had been running in place for decades under the profit-mongering Johnson. American Soul is a significant effort to get untracked and make a mark. Dramatizing how Soul Train came to be is a story well worth telling. And BET at long last has deemed itself the perfect place to do it.